This utility ensures a real-time synchronization of multiple charts. Any event of a graphical object creation/modification/deletion, chart scrolling and zooming is copied from the current source chart to one or more receiving charts. Note: demo-version of this product doesn't work in the backtester! Previous - previous chart in the list. Make exact copy at start - makes full synchronization once at startup: removes all previously existing graphical objects on receivers, and then copies all graphical objects and visual settings of the source into receivers. Ignore objects with prefix - the utility is able to skip objects with certain prefix in their name. 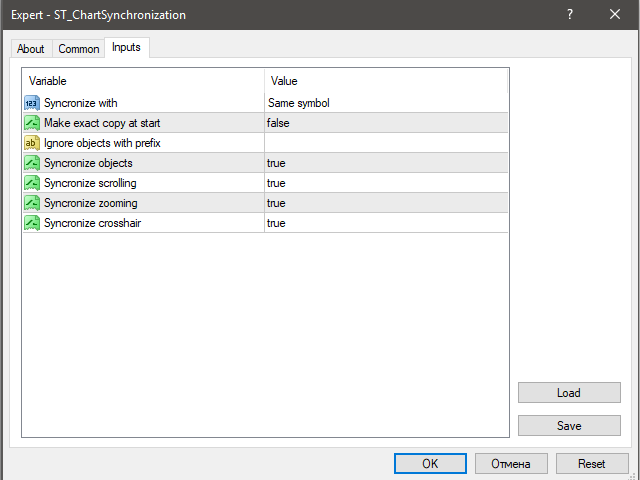 Synchronize objects - turns on/off synchronization of graphical objects. Synchronize scrolling - turns on/off synchronization of scrolling of the chart. Synchronize zooming - turns on/off synchronization of scaling of the chart. Synchronize properties - turns on/off synchronization of auto-scroll mode, chart shift from the right side (top triangle), chart "center" position (bottom triangle). Synchronize crosshair - allows to turn on/off crosshair tool by left click at the right-top corner of the chart on utility's name. This is not MT4 standard crosshair (ctrl+F), only a substitute. Note: Each chart has a small gray triangle along the bottom border, the so-called "center" of the chart. The utility performs scrolling the way that synchronized charts always have the same time in their "centers". This product is for MT4, version for MT5 is here. Was hopeful, but out of sync very often. 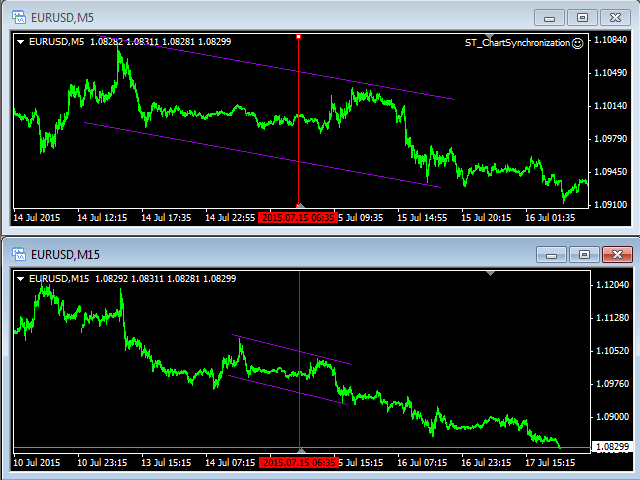 Found a free alternative on FF, the only one in the whole world of MT4 that is worth it. Literally tried all sync ideas out there. Excellent tool for synchronising charts, both for scrolling and graphical objects. Great for multi-time frame analysis and manual backtesting. Well worth the $15 USD investment. Highly recommended. My only wish is that i discovered this earlier. 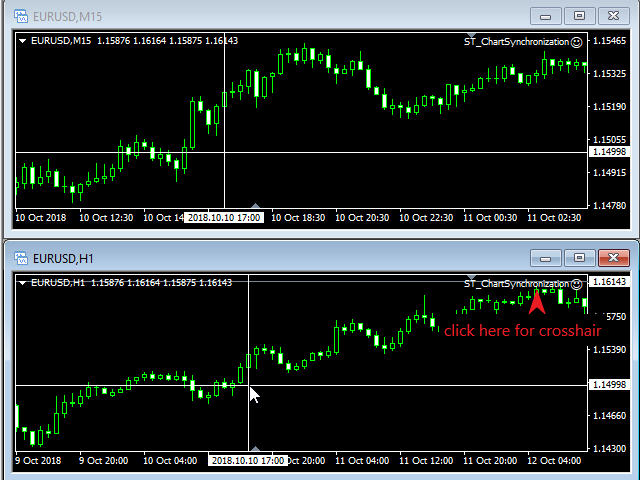 After going through countless sync indicators and tools I was able to find the perfect one - ST Chart Synchronization MT4! Works like a clock, syncs all of the objects between charts and does it very fast with no lag whatsoever! Great tool, highly recommend to anyone who is working with multiple timeframes and wants to save a lot of time on chart analysis. Thank you Irek for your hard work and this wonderful tool! 2. added synchronize properties option.